PR For Small Business - What Works Now | Lawrimore Inc.
PR for small business is not what it used to be. Shrinking media staffs and intense competition make it harder than ever to get your story into the media. We are frequently contacted by small business owners who want to “get some publicity” without realizing it is not a simple process. What’s really new about this story? Will my readers or viewers be interested? A recent story we promoted to the media concerned a young and fast-growing manufacturer of custom upholstered sofas and couches who had been selected by a national TV network to show their products on a reality show about redecorating older homes. New company, fast growth, new TV program, local angle, relevance to consumers – it resulted in a full-page feature in the local daily newspaper plus in-depth coverage by two TV stations. The owner said the publicity got him more business than appearing on the TV program, but the show provided a great “why now” for running the story just before the TV series started. Another story we produced about two local small businesses merging got very little media attention. Although it was new, it was not interesting to average readers. Another important tactic for getting PR about your business in the media concerns whether it is pitched exclusively to one media or broadcast to all media simultaneously. 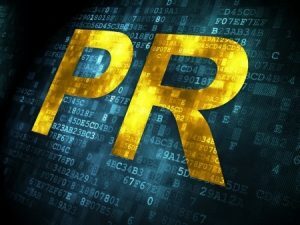 For best results having your PR firm work with a primary target media to pitch the story on an exclusive basis will give them time to consider it and to assign a reporter to interview the business owner, get a photo or video, and place it in the right slot in the paper or TV news broadcast. But when there is a genuine time factor to the story, such as an event or announcement, broadcasting it to all the media simultaneously is more appropriate – and hopefully the urgency of the story will get it published in more than one media. Traditional media like newspapers and TV stations are just a few of the many ways to get your story out to the public. You can become your own publisher by writing frequent blog posts or hiring a PR firm to do it for you. All the blogs we produce for clients use a free add-on piece of software called Jetpack which “automagically” captures the blog post headline and a few sentences and posts it to Twitter, Facebook, LinkedIn, Google Plus and Tumblr. This gets your news out across multiple social media channels with no additional effort. Of course you do need to attract followers to those social media channels, but producing great content is an ideal way to do that. Producing this content for multiple traditional and social media is known as content marketing. It consistently proves to be an ideal way to attract new customers, build your brand reputation, and raise your rankings in the search engines. For best results don’t create content about anything that pops into your head but instead focus on the search terms or keywords which potential customers are using to look for a provider like your business. Before writing this blog post I used Google’s Keyword Tool (which requires an Adwords account) to explore which keyword among several possibilities actually has the most searches per month. Somewhat to my surprise the highest-searched term is “PR” so you will notice it is the first word in the title of this blog post and the first sentence. Publishing content online that is not keyword-optimized is close to a waste of time. Instead, have a professionally developed keyword strategy that identifies and ranks about a dozen top keywords that you want to use to attract new customers. In summary then PR is a valuable tool to promote your business, but don’t limit yourself to local papers and TV news. Develop your own publishing program, using your staff or an agency, and produce some relevant content at least once a week. Get into the habit of doing this every week and you’ll identify some stories that are newsworthy enough to send to local media, and others that might just be informative for potential customers. The more you produce, the more new business you will generate. This has been proven effective by many small businesses in many different business categories, so it will surely work for you. My company provides PR and content marketing services for small businesses all over America, so use the contact form below to request more information or visit our website to learn more.